Over the last decade or so, Clevo has been one of the more enduring notebook original design manufacturers, particularly when it comes to gaming and workstation-centric desktop replacements. I’m talking about the kind of 17” behemoth notebook that weighs 10 pounds and has a power brick approximately the size and weight of a compact automobile. I’ve typically shied away from reviewing this type of machine, because I typically would never use one for my day-to-day computing needs. I understand the value that they hold, but I tend to enjoy a lot more mobility in my mobile computing devices. But when I got the chance to review a system from Clevo’s newly redesigned line of Haswell-based gaming systems, I jumped at it. This particular system came from our friends at Eurocom, with a configuration that made me legitimately laugh out loud when I saw it. 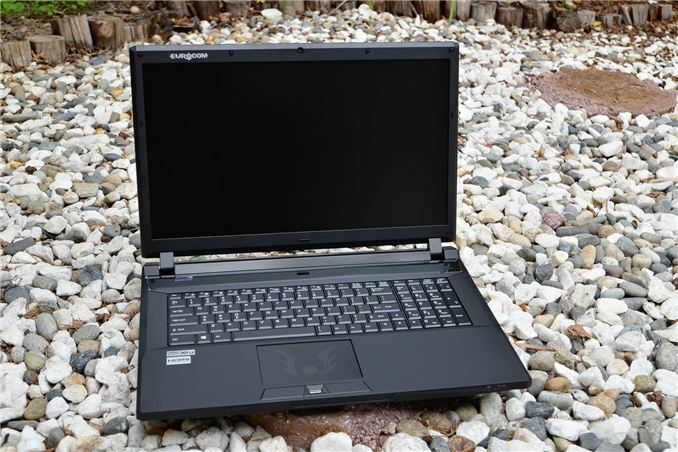 Based on the Clevo P177SM barebone, our Eurocom X5 evaluation unit came with an i7-4930MX, NVIDIA’s GTX 780M, 32GB of memory, a Chi Mei N173HGE 17.3” 1080p display, a 120GB Crucial M500 mSATA SSD, and a 1TB hard drive. Originally, I was supposed to get one with a pair of SSDs and a pair of mechanical storage drives, but apparently saner heads prevailed at some point. Dimensions 16.56" x 11.44" x 1.0-1.84"
The i7-4930MX Extreme Edition is the most expensive SKU in Intel’s mobile Haswell lineup, at $1096, and comes with four Hyper-Threaded cores clocked at 3.0GHz (max turbo is set at a lofty 3.9GHz). The 57W TDP is a full 10W higher than the normal i7 mobile quads. The onboard graphics processor is Intel’s HD 4600 (GT2) with 20 execution units at up to 1.35GHz. The dedicated graphics card is obviously of more value to us in a system like this—this is the same GTX 780M we looked at in the MSI GT70 Dragon Edition and Mythlogic Pollux 1613, with 4GB of GDDR5 VRAM, a 771MHz core clock that can boost up to ~850MHz, 5GHz memory clocks, and a 256-bit memory bus. Like the MSI, the Eurocom relies on Qualcomm Atheros Killer Networking, with the dual-band 2x2 Killer Wireless-N 1202 card providing 802.11a/b/g/n. I’ll be thrilled when ac is a default, but sadly it’s hard to rely on some PC manufacturers even giving us the 5GHz WiFi band in $1000 notebooks, so I’ll consider it a pipedream and pray for the day when my notebook PC has more advanced wireless connectivity than my smartphone. The total sum for this particular Eurocom X5, as delivered with Windows 7 Home Premium and a calibrated display, is a staggering $3494. That’s on the verge of insane, and I honestly can’t advocate anyone who actually has to pay for one of these springing for the $826 Extreme Edition option—save $650, scale back to the 2.7GHz (3.7 turbo) i7-4800MQ, don’t pay $477 for a RAM upgrade that really only costs $250 if you bought the parts yourself on Newegg, etc. Pricing looks much more reasonable if you exercise sound financial judgement in the configuration stages. I think my ideal configuration involves a similar storage configuration to our evaluation unit, with a 120GB or 240GB mSATA SSD and 1TB Hitachi hard drive, as well as the GTX 780M option (an absolute must-have), but scaling the CPU and memory back to the 4800MQ and 16GB saves $1120, and tweaking connectivity (I’d save $55 to go with Intel’s 6235 WiFi/Bluetooth instead of Killer-N 1202) and optical drive (the $110 Blu-ray recorder is meaningless for me) options will save a bit more on top. For reasons I can’t explain, Windows 7 Home Premium costs $15 more than Windows 8, so there’s that too. Mess around a bit, and you’re left with a system that’s 98% as capable as our $3500 review unit and retails at $2237. Of course, one of the interesting questions is finding out just how much faster (or not) the i7 Extreme processor is relative to other CPU choices. We've now tested several i7-4700MQ systems, and we had the i7-4900MQ with the Mythlogic, where we discussed some of the situations where the GTX 780M can be bottlenecked by the CPU. This is as fast as you're going to get in a modern notebook, so it will be fun to turn the dial up to eleven.